Building total body strength and conditioning is no easy task. It takes time, effort, and consistency. Developing strong shoulders, hips, and knees can easily fill a twelve-month training program. Does that sound like a lot? It is. Enter the Get-up Ethos Program. The get-up develops overall strength without you having to spend hours in the gym each day, moving from lift to lift, and completing varying loads and volumes. Making the get-up your primary lift, performing it daily, and sprinkling in a few other compound lifts for technique will see your numbers improve across the board. I used this program to help me press my half-bodyweight press at my SFG Level II Certification. Two days later, I performed a personal record get-up of 52kg and hit a new max in my pull-ups. This was after two days of hard training and testing at the Cert, air travel, and long days of coaching. In the pull-up, I was able to grip the bar harder, creating greater tension for my pulling power. In addition, I had the mobility and strength through my upper back to smoothly pull chest to bar. Both double-rack front squats and back squats felt tighter, with my ability to stay taller through my upper back and brace my abs harder being a noticeable difference. In short: everything felt better. I received help in my SFG Level II preparation from SFG Team Leader Artemis Scantalides. Five days per week, I trained multiple get-ups with varying loads. The get-up had been something that I, and my athletes, had mostly performed as single reps. After months of the multiple get-ups and the results I saw, I began implementing this approach into my clients’ programming. In both one-on-one and small group test environments, improvements of movement quality, strength, endurance, and body composition have been noted, as well as increased understanding of movement competencies. With these results, I have created the Get-up Ethos Program. Below you will see the exact plan, but first let’s go over some basics. From helping athletes move their bodies better to improving pull-ups, back squats, and beyond, the get-up teaches “kalos sthenos,” or “beautiful strength,” as well as movement competency and patience in droves. The get-up builds strong joints and muscles. With the variety of directions in which the get-up requires the body to move, the hips and shoulders learn to tie the body together as one fluid piece. The premise of this program is to do multiple get-ups in a row, without resting the bell. 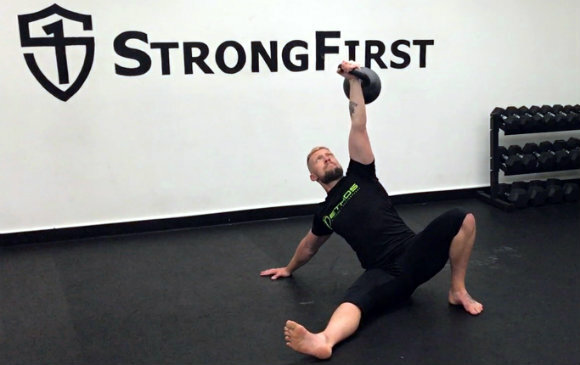 You will perform one full get-up, bring the bell back down to the supine position with your arm pressed, and then roll straight back to the elbow for rep two. And then three. If the get-up offers all we say it does (and it does), why are we not using the way we use the other foundational lifts of swings, cleans, and snatches? Provided that form is dialed in, the function of the get-up can be repeated for greater results. Building now not only strength and mobility, but also conditioning due to the increased time under tension. It can be tricky to progress any lift. Staying safe while increasing load, volume, and/or intensity is essential. But we can’t be so cautious that we never get any iron over our heads. The following program progresses accurately and safely to create gains across multiple other lifts. The program assumes you can perform a single get-up on both arms, with form that meets the StrongFirst technique standards. If you are not able to do so, this is not the program for you right now. The next assumption is that you are willing to dedicate a significant portion of every training session to the get-up for five days each week. As the saying goes, “If you want to press a lot, you must press a lot.” The same is true for the get-up. The bonus here is that you will also be able to press a lot (among other things) at the end of this get-up driven program. To begin, safely test your one-rep-max get-up. Get a spotter to help, employ the help of an SFG Instructor, or video your lift. If the lift looks bad, then it’s a no-rep. This 1RM number needs to be accurate to calculate your program percentages. For the purpose of this article, I have assumed that 48kg and 24kg are the achieved 1RM for men and women respectively. This may be off for you, and if your 1RM is below 16kg, then your time will be better spent dialing in your technique with practice of single repetitions. If your 1RM is different from left to right, choose the lower of the two and train the same percentages on each arm. This will go some way to helping you even out the imbalance. Phase 1: Practice—Weeks 1-4 are the practice. You’ll get acclimated with the sheer volume of the movement. Grip, wrist pressure, and shoulder stabilizers must acclimate to the rigors of increased density safely and without exhaustion. Leave your ego at the door and stick to the plan. Phase 2: Accumulation— Weeks 5-6 work on volume. Here you will accumulate more overall tonnage and movement. Recovery and nutritionwill aid in your progress. Phase 3: Mass—Weeks 7-12 focus on increasing the mass per single lift. The total amount of load as well as the average load per lift is noted below in the prescription. Although this may look like a complicated cycle, it is actually quite straightforward. If your 1RM is not 48kg, then it will take a little deconstructing to determine your percentages per lift. Should you hit a wall, it is fair to assume that taking a few days off will help you reset and recover. There is no denying this is a lot of work. Rome wasn’t built in a day. But they were laying bricks every hour. Watch your grip and forearm strength improve dramatically. Upon completing this program, it felt as though my hands had grown (being that I am a thirty-year-old male, this is unlikely to have actually happened). After twelve weeks, my palms felt like cast-iron skillets and my forearms like concrete pillars. This had huge carryover into the rest of my training. I experienced significant gains in my pull-ups and squats, increased mobility in my back, and a greater work-load capacity. With adherence to this program, you will no doubt find similar results. Before starting this program, understand the standards, requirements, and time commitments. Have an SFG Instructor look at your technique before you embark down a road with anything out of place. Recognize that missing a day of training is not a deal-breaker by any means, but this program does require significant time with a bell in your hand.